I think spring has finally decided to arrive here...I think. We've had 75 and sun one day and 55 and rain the next. Looking forward to more days of sun and warm weather soon! I chose the curated box again for May. 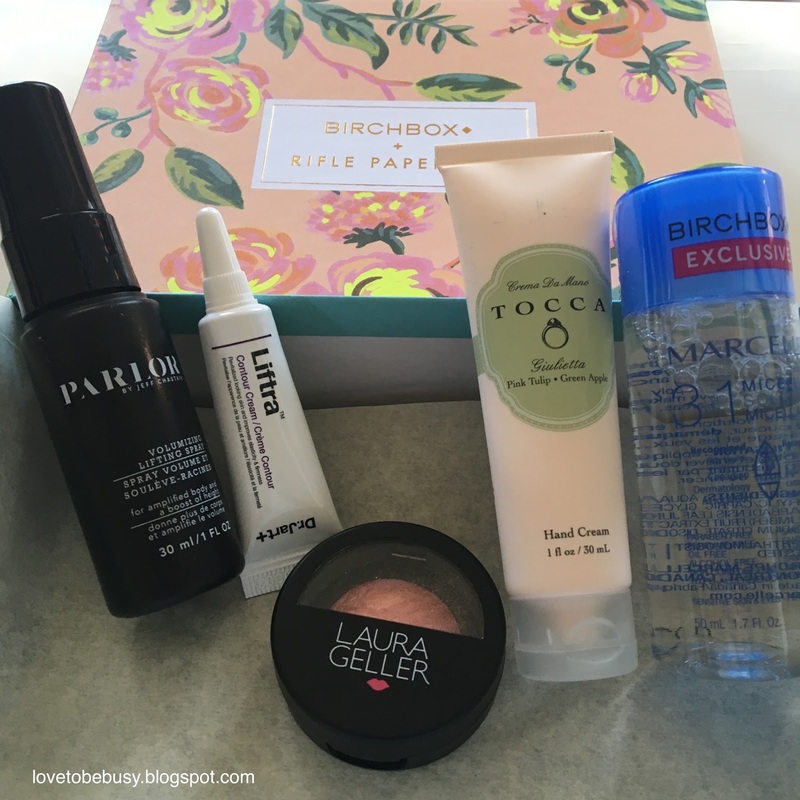 I usually like the surprise of seeing what Birchbox chooses every month but the curated boxes have been so good lately that I've been choosing those instead. We will see what June brings. For now, I'll share what was in the May box. I didn't see a theme on the card for this box. However, I absolutely love the print of the box I received. They say that they have partnered with Keds and have shoes with the patterns in the Birchbox shop. I am seriously considering picking up a pair. I've never tried Hoola bronzer so I'm excited for that. I have liked Davines products in the past although I'm not sure I need products for coarse and frizzy hair (frizzy maybe). I'm excited for everything else too! This was a great choice this month. Now, on to reviews of the April's box. I had chosen this box for the Marcelle and Laura Gellar products and I was not disappointed. Marcelle 3-in-1 Micellar Solution - I absolutely love this product. I use this as the first step to remove my makeup before I cleanse. I do not have the type of skin that can use this product instead of a cleanser, however I know some people like it for that purpose in the morning. This might be out my Holy Grail Sephora cleansing water only because it doesn't sting my eyes at all. I took this on a recent trip and didn't need a separate eye makeup remover. This did a great job on my face and eyes to remove everything. I'll definitely purchase this in the future! Dr. Jart+ Liftra Contour Cream - First off, this cream is very sticky. I was not a fan of the texture of it and it made my face feel sticky. In addition, I didn't notice any lifting effects along my jawline (that is where it was instructed to apply it). Perhaps the sample wasn't big enough, but I didn't notice enough of a difference to make me want to spend $60 on this product. Laura Gellar New York Baked Blush-n-Brighten in Tropical Hues - I absolutely love this product! It applies so nicely, wears great, and has a subtle sheen to it that I love. I'll continue to work through this sample but I would consider buying a full size of this product, as well as trying other products from this brand. Parlor by Jeff Chasten volumizing lifting spray - This was a fine blow dry spray. I didn't notice any difference from the ones I have used previously such as 12 Benefits. This wouldn't be a must purchase for me. Tocca crema da mano in Giulietta - I absolutely love the scent of this hand cream. I have been using it every night before bed. The card that came in the box says that this cream absorbs in a flash. And I feel like that is definitely true, almost to the point of not feeling super moisturizing. After I apply, I sometimes feel like I still need to apply lotion. It doesn't moisturize like I prefer. The Marcelle micellar solution and Laura Gellar blush would definitely be purchases for me! What have you received lately? Any great products?